While unsightly, dumps and landfills are a necessary part of modern life. Nobody wants to live near one, but every community needs them. If you take a look at the MoveMap, you will see that Orlando has quite a few dumps, landfills and waste processing centers. In fact, you’ll probably notice a lot more points than you would expect. You’ll also see that some are located in odd places. In this blog post we’ll talk a bit about why landfills are important to know about in Florida, why there are so many on the map, and discuss a few notable facilities in the Orlando area. While landfills are an essential component of urban communities most of them are located well outside of populated areas. The reasons aren’t hard to imagine, dumps produce noise, smells and traffic. Even at a distance however, landfills can still be problematic – due mostly to odors and groundwater pollution. Even if a property is located miles away from an active facility, prevailing winds can make odors a problem. So if your potential new home is located near a landfill (even if you can’t see it from your house), it’s a good idea to visit a few times or more and ask the neighbors if they ever experience any aversive odors. Groundwater pollution is another issue. Most modern landfills are built with liners that in theory prevent rain water percolating through the landfill from entering the groundwater. In practice however, almost all liners leak. Most of the time, this is not a problem since the volume of water is small. Although unlikely, large breaches do occur from time to time and do result in substantial groundwater pollution. Almost all currently operational landfills (and many that have been closed) have groundwater monitoring wells so that if a breach does occur, it can be caught and dealt with (to the degree possible). Groundwater pollution is a serious environmental issue, but from a human health standpoint, it matters mostly to folks on well water that live in relatively close proximity to a dump or landfill. If you’ve looked at the MoveMap, chances are you’ve noticed a lot more dumps and landfills in Orlando, FL than you’d expect. You might have even seen some in Baldwin Park or downtown Orlando, which doesn’t seem to make much sense. Don’t worry, we’ll explain things. The Florida Department of Environmental Protection (FDEP) wants to know where Florida’s trash ends up. To this end, they track many types of waste and numerous officially sanctioned and impromptu and illegal disposal facilities. The diversity of trash tracked and the types of facilities flagged are why you see so many points. FDEP certainly wants to know about active landfills, but they also track illegal dump sites for cleanup and monitoring purposes. Closed sites are also tracked. Moreover, recycling centers, transfer stations, incineration plants and variety of other types of facilities that handle trash also show up, right along traditional landfills and dumps. 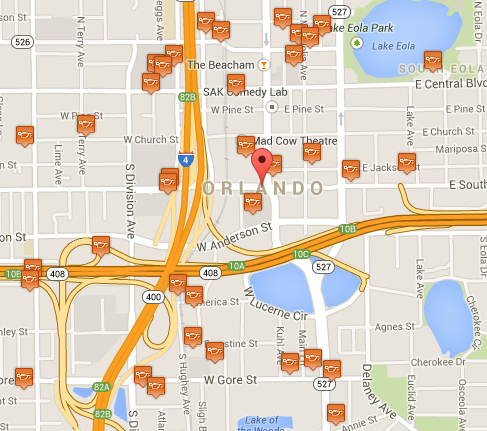 This brings us to a few notable dump/landfill centers in the Orlando metropolitan area. The Orange County Landfill services much of Orlando and is a traditional, legal landfill. It is located at 5901 Young Pine Road, Orlando, FL 32829. It takes most types of domestic waste. As a benefit to Orange County residents it provides free compost, which it produces from the yard waste that it collects. The next notable landfills we’ll discuss are located in Baldwin Park, Orlando. If you’ve ever been to Baldwin Park, you won’t be able to believe that there are landfills in the middle of this beautiful, vibrant community. However, many people are unaware that the parcel of land now home to Baldwin Park used to be a U.S. Navy base. That base needed places to get rid of its refuse, and those places are what show up on the map. Although the area has been redeveloped into one of the most attractive communities in central Florida, FDEP still tracks the sites. Some contamination has been verified to exist from activities that took place on the base, but it is contained fairly deep below the ground surface. Baldwin Park is an interesting example of how historically unwanted land uses can be redeveloped into successful communities. The last facility we will briefly discuss is the Orlando Regional Medical Center. As with Baldwin Park, seeing a dump/landfill in the middle of downtown Orlando doesn’t seem to make much sense. However, hospitals produce a great deal of a specific type of trash – biohazardous waste. This sounds scary, but in reality it’s pretty routine, biohazardous waste consists of needles, wound dressings, etc. and these types of wastes are produced by practices as common as dentist’s offices and veterinarian’s clinics. Since hospitals produce a lot of this type of waste and it has the possibility to cause infectious disease, it is tracked by both the Department of Health and FDEP. Living near one however, doesn’t pose any real risk of disease or infection. We hope you have found this blog post interesting and enlightening. We encourage you to check out dump and landfill facilities near your prospective residence using our MoveMap on www.moversatlas.com. Good luck with your home search! Unfortunately, petroleum contamination is extremely common in Florida and many other states. In fact, if you turn on the Petroleum Contamination points on our MoveMap, you’ll see a pretty depressing sight. The petroleum sites in Orlando alone number in the hundreds. This is a concern in Florida because in most of the state, groundwater is very close to the surface and it provides drinking water to around 90% of residents. Fortunately, the Florida Department of Environmental Protection (FDEP) tracks petroleum releases and in some cases helps remediate (clean up) the sites. In this post, we’ll talk a bit about how petroleum releases happen in Orlando, why they’re so common, and finally, what the implications are to you as a resident. The reason so many sites can be seen on the MoveMap for petroleum contamination shouldn’t come as a surprise; it is simply because petroleum use is extremely common and accidental releases occur frequently. A recurring cause of soil and groundwater contamination is leaking underground storage tanks. Storage tanks are commonly found at gas stations but also exist near backup generators and other equipment. Since Florida is prone to hurricanes, backup generators are especially numerous here, and their fuel tanks do occasionally leak. Unfortunately, gas station and generator tanks can give out without anyone noticing for quite some time. In such cases, gasoline or diesel fuel can drain out of the rupture point and contaminate soil and groundwater. Factories, junkyards, mill sites, shipyards and transit stations can also be causes of petroleum contamination. Accidental spills of gasoline, diesel, jet fuel and used oil contribute to the situation as well, though spills of under 25 gallons are not required to be reported to FDEP as long as the spill and affected soil are cleaned up immediately. While the geographic area affected by oil contamination tends to be fairly constrained in the case of gas stations and other tank failures, the area contaminated by petroleum can be quite large in junkyards, factories and the like. Depending on the nature of the soil and groundwater flow, the petroleum contamination may stay fairly contained within the site or expand out beyond the actual property boundaries. Since gasoline and diesel fuels are lighter than water, they tend to “float” in the upper part of the water table. Over time, the fuel will tend to move with the groundwater currents causing an elongated plume. While the results sound bad, the fact that petroleum floats is generally good news for Florida residents since most people on well water tap the Floridan Aquifer, which is very deep underground. However, petroleum can and does occasionally poison drinking water wells, and chronic exposure to oil products can affect the nervous system, blood and kidneys. Furthermore, petroleum contains benzene, which is a known human carcinogen. So if there is a contamination point located near your home or a piece of real estate that you are considering buying and a well is used, it might be a good idea to get the water tested from time to time. The state of Florida does operate a petroleum cleanup program, but it is complex and the details are outside the scope of this blog post. Generally speaking though, once the government has identified an area which requires cleanup, it will either excavate the soil and process it to remove contaminants or place that soil in a landfill. Contaminated groundwater may also be removed and processed before being re-released into the environment. Depending on the nature of the site, groundwater monitoring equipment might also be installed. Petroleum contamination is an unfortunate consequence of our modern standard of living and it does have implications for home buyers and renters in the Orlando area. However, most petroleum contamination happens in commercial and industrial areas where people do not live. In many cases therefore, it tends to be more of an environmental concern than a direct threat to human health. Nevertheless, if you’re considering buying property close to a contamination site in Orlando Florida, it’s a good idea to get your well water tested. 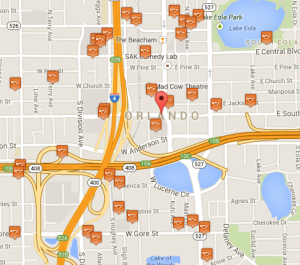 To check out petroleum contamination in Orlando and other areas of Florida, have a look at our MoveMap over at www.moversatlas.com.